Let us take a moment and recall some of the greatest stories ever told through the medium of video games. Recall the daring rescues of princesses, and the recoveries of mythical blades. Tales of friends, ever true, and of villains most cruel. Stories of ancient and enraged gods and entities, whose wrath threatens to end the world like the hangman’s noose. Think of pure adventure, and expeditions into the dark unknown. And reconsider how true love paved the way for every single hero, from the darkest depths of Hell to the light of day. Few video games—let alone any other sort of media—get as many storytelling elements right as Mistwalker’s The Last Story. The game represents the long-awaited collaboration between two of the greatest figures in video game design, period; director (and head of Mistwalker) Hironobu Sakaguchi, and beloved composer Nobuo Uematsu. Both luminaries are directly responsible for the advancement of the RPG genre, famously creating the first several Final Fantasies together. That being said, the expectations for The Last Story’s design and music are exceptionally high—especially since Sakaguchi has been reported as saying that he worked on the game like it was his last video game, ever (thus the title, The Last Story). Thankfully, The Last Story delivers on both these fronts and more. The game’s plot is somewhat cliched, but in the sub-genre of JRPGs, it’s hard to avoid that. It is The Last Story’s characters that really drive the plot. And boy do they drive it. Each character is remarkably likeable, and when the main cast is together it creates for some of the most heartwarming and engaging scenes in recent video game history. This is because of how dynamic the main cast’s personalities are. The Last Story follows the exploits of a band of mercenaries, who come to the beautiful Lazulis Island in employment of the nation’s ruler, Count Arganan. The main character, Zael, is often reserved and lost in daydreams. Dagran is the mercenaries’ leader, and is Zael’s older brother figure. He always does what is best for his group, even to a fault. Then there’s Yurick, cold and taciturn, who doesn’t see his little family as more than workmates. Counterbalancing him is Syrenne, a loud-mouthed, often drunk woman who is never afraid to ‘tell it like it is.’ Rounding out the group is Lowell, who constantly flirts with anything that moves (including Syrenne), and Mirania, the group’s quiet-yet-insightful healer. A slim number of video games are able to pull off so much character development with so many characters. The Last Story achieves this, and it’s why each character is so identifiable. The Last Story is, at its heart, a love story. Early on in the game, Zael meets a girl who calls herself Lisa, and the two quickly fall in love. This chance encounter spurs The Last Story’s plot onward. Throughout the game we see their relationship grow, and then fall apart, and then blossom once more. This story element has been done a thousand times, yet thanks to Sakaguchi’s incredible storytelling talents, it feels fresh. As the plot thickens, you want the two of them to be alright, and keep their relationship intact as their lives fall apart. Of course, The Last Story’s best moments, be them tender, bittersweet or blood-boiling, would not be brought to life in the way they are if they didn’t have Uematsu writing the score. The pieces of music found in The Last Story are some of Nobuo’s absolute best. The swelling violins that convey the ‘love-at-first-sight’ emotions of Zael and Lisa. The adrenaline-pumping low brass melodies that make an already very memorable final boss fight even more remarkable. Even during the game’s regular fights, listen closely and you’ll hear the music change from somewhat suspenseful to reassuringly heroic as you turn the tides of battle in your favor. Speaking of battles and fights, The Last Story’s battle system is one of the best in any Japanese role playing game, ever. Think of it as a ‘lite’ version of Final Fantasy XII’s Active Dimension Battle system. You control Zael, and your teammates are all AI-controlled. During combat, lines will appear from enemies to your characters, signifying where they will attack. Attacking is simply done by running up to an enemy; Zael will automatically strike. Battles are also very enthralling. During some skirmishes, the characters’ emotions (and in turn, mine) ran high, and I found myself swinging my Wiimote along with Zael’s sword, despite it being completely unnecessary. What makes The Last Story’s fights so unique and engaging are how they borrow the best of different genres. Elements of real-time strategy games (specifically tower defense) are present; before most of the battles in the game, the party will assess the opposing formation, and give you (the player) tips as to how to go about winning. Amidst a fight, Zael can issue commands to his teammates. This is done in a manner that blends RTS with traditional menu-based RPG fighting. Remarkably for a JRPG, elements of stealth are invoked as well. At some points in The Last Story, Zael will have to sneak around a group of enemies to get to a vantage point. 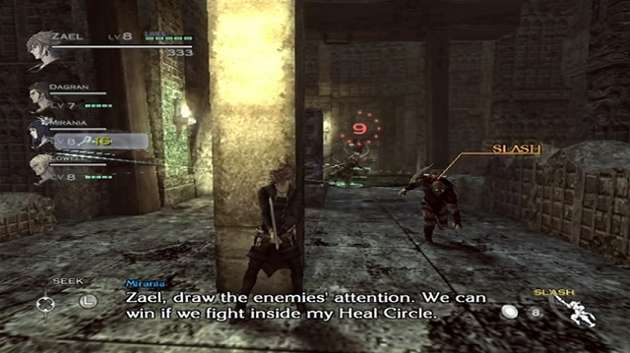 Using the Gathering ability he stumbles upon early in the game, Zael is able to draw enemy fire to himself, while his teammates flank from the side or begin casting spells. 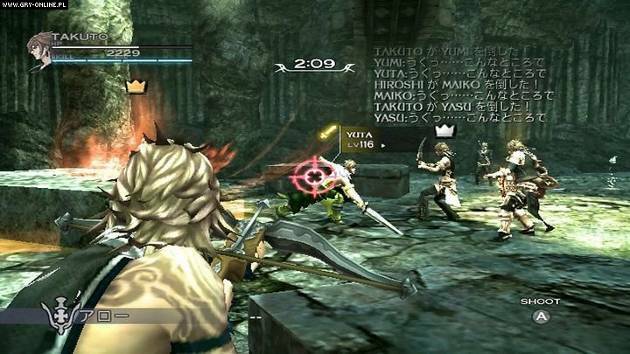 Gameplay in The Last Story also employs elements found in first-and-third person shooters. Zael is equipped with a crossbow that he can use to snipe enemies with. Certain scenes in the game make use of a first-person viewpoint, where the player must guide Zael’s line of sight to a specific object or anomaly. Highly unusual for a game of this type, yet intuitive given the nature of combat, is the ability to hide behind objects and take cover. This makes for added survivability against some of the more intelligent enemies you’ll come across, and is reminiscent of the cover mechanics in games such as Gears of War and Mass Effect 3. Another wonderful feature found in The Last Story is the ability to customize each of the main characters. Each piece of armor looks different from another. Unfortunately, some of them can look quite ridiculous as they are improved, as each new upgrade adds a piece of armor or covering. However, individual pieces can be removed. Players can also change the color of each character’s clothing, down to each little component of the armor they’re wearing. 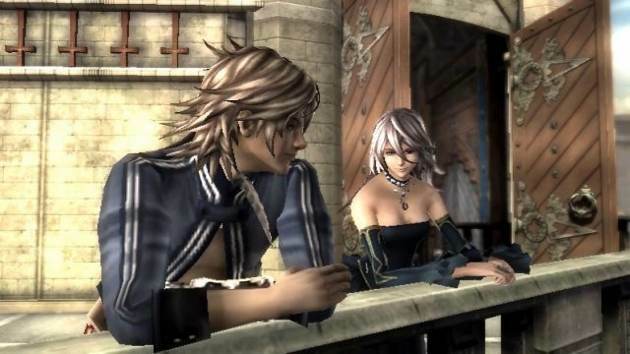 The Last Story’s graphics are among the Wii’s best, although they’re a far cry from what the Xbox 360 and PS3 can do. Character models are fully-realized, and their facial expressions usually sell the emotion they’re going for. However, there are times when a character’s mouth movement isn’t synced with the dialogue they’re speaking. Worse, sometimes their mouth won’t move at all. This can be a little disengaging. However, the world in which they interact is intricately detailed and very much explorable. The art direction found in The Last Story is absolutely fantastic, and is decidedly high-fantasy. Hironobu Sakaguchi has stated that he didn’t want to include any science-fiction elements to the game’s design, and sure enough, he kept his word. Every building, piece of furniture, merchant stand in Lazulis City—it’s all inclusive with the high-fantasy theme The Last Story presents. Also to the game’s credit is the quality of the characters’ voice acting. JRPGs have a bad reputation for having abysmal English voice actors—something which The Last Story avoids at all costs. I was blown away at how well the characters were voiced. The entire cast is British, from Zael and Lisa and Dagran to the NPCs you run across in the streets. Perhaps that’s why the voice acting in The Last Story is wonderful. 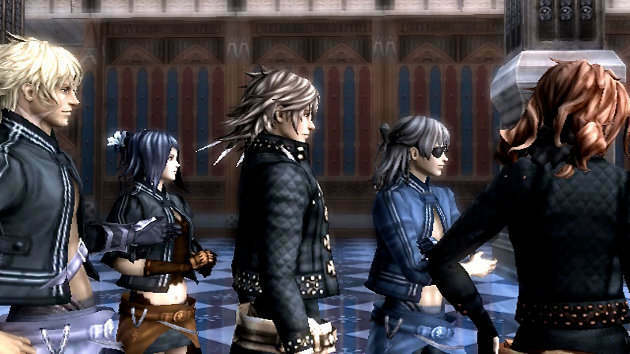 The Last Story also features a multiplayer mode. That in itself is a rarity in RPGS, especially ones of Japanese design. Multiplayer is split into two styles, called Fray and Suppression. Fray is an all-out deathmatch between up to six players, while Suppression is coop, and has players working together to take down tougher versions of the storyline’s bosses. That a JRPG even has a multiplayer mode is a huge testament to the quality and ingenuity of its battle system. Unfortunately, every game has its flaws. In a JRPG as ambitious as The Last Story, flaws are unavoidable. Given the multi-genre nature of the game’s combat system, your party’s AI can be rather useless at certain points. I realize this may simply be the game encouraging the player to use Zael’s Command Mode, but some parts just felt lazy. For instance, during one fight, Lowell (who attacks with ice magic) identifies an enemy as being ‘highly resistant to ice spells.’ He then proceeds to blast them with ice. While taking cover is a huge ingenuity for a JRPG, doing so can be a tad clumsy. Speaking of controls, motion control is mysteriously absent from The Last Story. It would have been a nice plus to be able to move the crosshair during the first/third person segments with your Wiimote, not the control stick on the Nunchuck. The Last Story is a remarkable game. It represents the best of not only the RPG genre, but borrows the best of strategy and shooter games. Sure, it may have its flaws, but none of them are game-breaking. As for the game’s length, expect to put in a good 20-25 hours. The Last Story will go down as one of the greatest stories ever told through the video game medium, and I urge everyone to experience its unique brand of storytelling. Play The Last Story like it was designed—be the hero, save your love, and play it like it’s the last story you’ll ever read. Interesting. I can’t wait for the Wii U to come out so I can get a Wii extra cheap. This was on my list of games to check out, but now I think it’s going onto the “must get” list. Completely agree about the motion controls missing. The game begs for motion controlled crosshair, I couldn’t believe it wasn’t incorporated in the control scheme, at least as optional! Did the developers ever say anything about why it is left out?